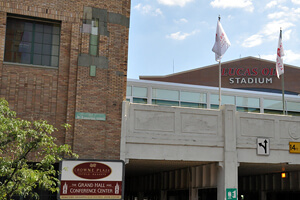 The Crowne Plaza just steps from Lucas Oil Stadium. Hoosier Hospitality awaits! The DCI World Championships will return to Indianapolis for the fifth straight year Aug. 8-10, 2013. To fully take advantage of all three days of exciting competition you'll want to make sure you have your "home base" set well before you arrive to the Circle City's bustling downtown. We've put together special blocks of rooms in many of the most popular downtown hotels, and reservations are now being accepted! Playing host to some of the nation's biggest sporting events, from the NCAA Final Four to the Indianapolis 500 to Super Bowl XLVI in 2012, Indianapolis knows hotels. Boasting one of the most dense concentrations of places to stay (most within walking distance of the stadium!) in the more than 40 year history of the DCI World Championships, Indianapolis will put fans front and center, right in the heart of great dining, entertainment, cultural activities and more. Check availability, amenities, and book today at DCI.org/IndyHotels. NEW Hotels Added for 2013! Check out these excellent locations that have been added to Drum Corps International's block of hotels for the 2013 World Championships. 1. The brand new Alexander (to be opened in January), located at Delaware and South Streets due east of Lucas Oil Stadium, boasts 157 stunning guest rooms, 52 extended stay suites, and an emphasis on art and design. 2. Located just a few minutes from Lucas Oil Stadium, the Candlewood Suites sits just off of Indianapolis' picturesque White River and in close proximity to the Indianapolis Zoo and White River State Park.